The June 2007 meeting was held at Jack Putnam's garage. The treasurer's report was given by Jack Putnam. We had a total of 12 members and guest present. The upcoming Bluffton Mennonite Home display for Saturday June 9 was discussed. The June 10th - 50th Anniversary of the Lima Ford plant was also discussed. Since the July meeting was going to fall on the 4th of July, it was decided to cancel the meeting and continue with the August meeting. The meeting was adjourned for grazing and in depth discussions by the members. Since our last meeting, two of our Model T Family have been taken. Just last week Dennis Russell's father Ralph passed away and a couple of weeks earlier Earl Peters' wife, Mary, passed away suddenly. The Keystone Cops would like to invite all of the Northwest Ohio Club to join them for their annual tour that will be held this year in Ohio. We will be touring Dover, Dennison, Mount Hope, Baltic, and Roscoe Village. This is a camping tour that features home cooked meals for breakfast and supper, under the shelter at Camp Wanake. Participants may choose to camp or stay in a hotel that we have arranged for a group rate. The tour begins with check-in on August 15th starting at noon. We will share a dinner at Mrs. Yoders Kitchen in Mount Hope that night and begin the three day tour on Thursday. The tour ends with Sunday morning breakfast at the camp site. This will give those from the east coast time to get back home. There are many gravel roads on this tour and good brakes are a must. I guarantee an experience that you'll remember for many years to come. Call Jim Cook for details (419) 927-4150 and leave a message. I promised to share a few of the pictures from Bill Timmermeister's fun barn near Indian Lake. 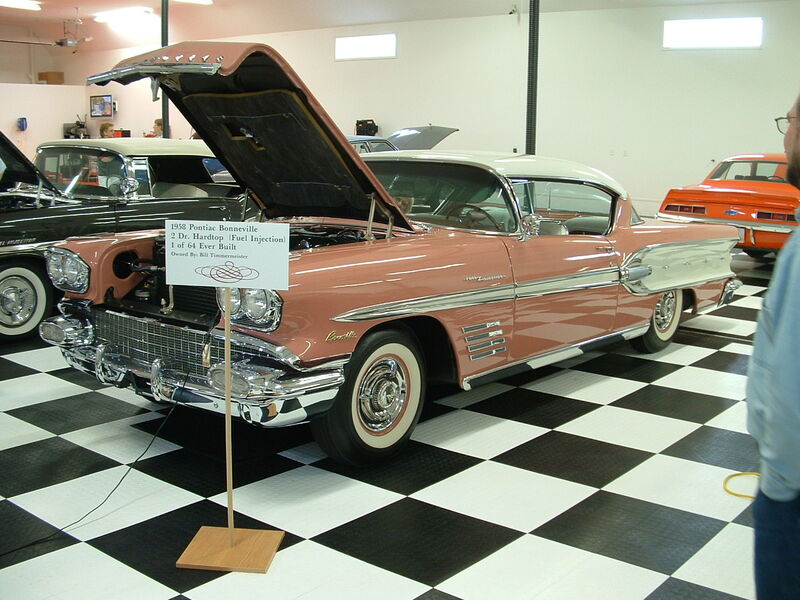 This car is a 1958 Bonneville 2 Door Hardtop (fuel injection). One of sixty-four ever built. The sun visor on this car slid down from above, with a cutout to get around the rear view mirror. 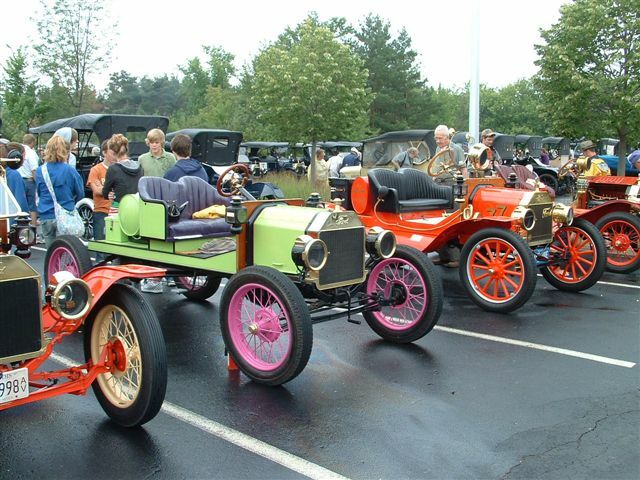 This is the group of Northwest Ohio Model T Club members that attended the National meet in Grand Rapids, Michigan. 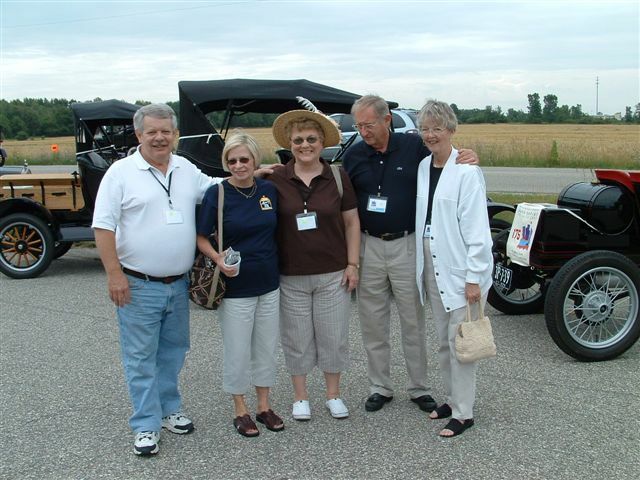 From left to right we see Jack Putnam, Ann Torbet, Marilyn Putnam, Ken Stuckey, and Betty Stuckey. Bob Torbet took the picture (we all know what Bob looks like). It was a good opportunity for the group to see what one of the big national tours was like. Ask any one of them and I'm sure that they can give you the rundown. 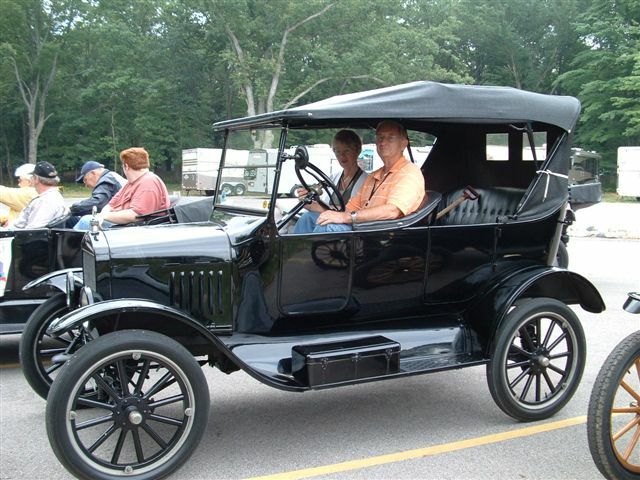 Everyone is always complaining that the Model T clubs will die off because the kids now-a-days don't care about old cars. Here we see a bunch of youth behind one of the young lady's speedsters. I'm not sure which one belongs to which young person; but, I believe this one belongs to Sarah Zimmer. Ken Stuckey and wife Betty have become a real presence on the touring roads lately. Ken has the car running good and has the time needed to get out there and participate. Keep up the great work Ken!! You're representing the club nicely. 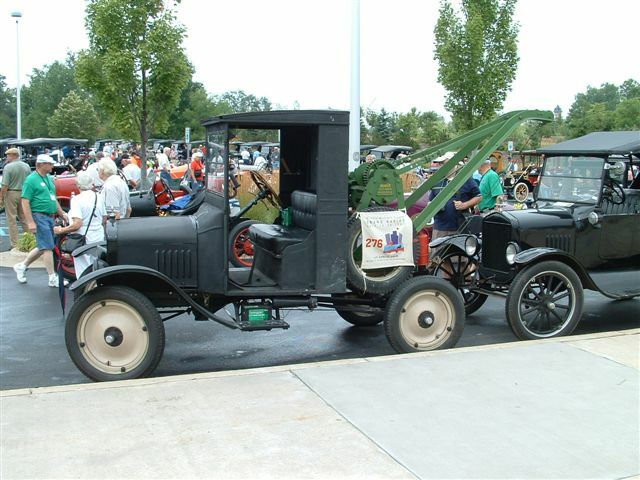 I've been to a lot of events where there were Model A tow trucks. This is the first Model T that I've seen in this configuration. 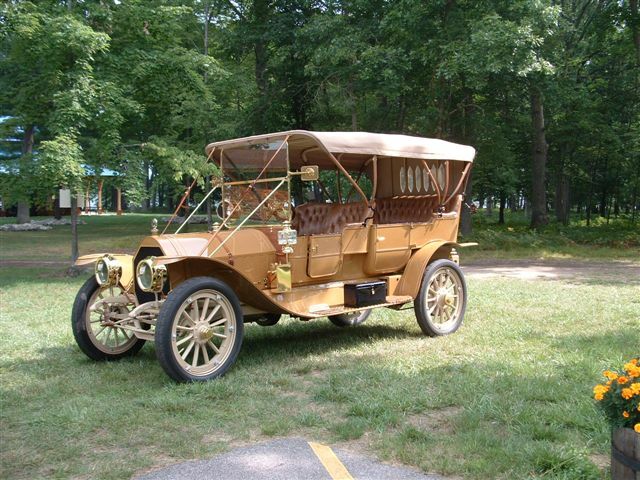 This 1910 Mitchell is one of the 15 to 20 antique cars that Bob Torbet said they encountered at an RV camp stop while on the tour. I can tell you a little bit about this car and the owner if you come to the meeting. As Bob noted, "These guys are in a class all their own". 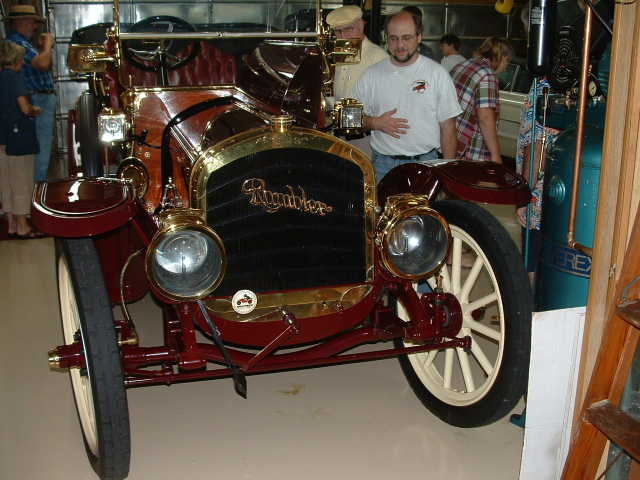 There were also Marmons, Cadillacs, Pierce Arrows, Packards, and even a great looking Rambler. I'd be willing to bet that the Rambler that the guys saw is pictured below.